It would never occur to me to tell my daughter that “that’s for boys” if she wants to play football, wear pants, cut her hair, whatever. 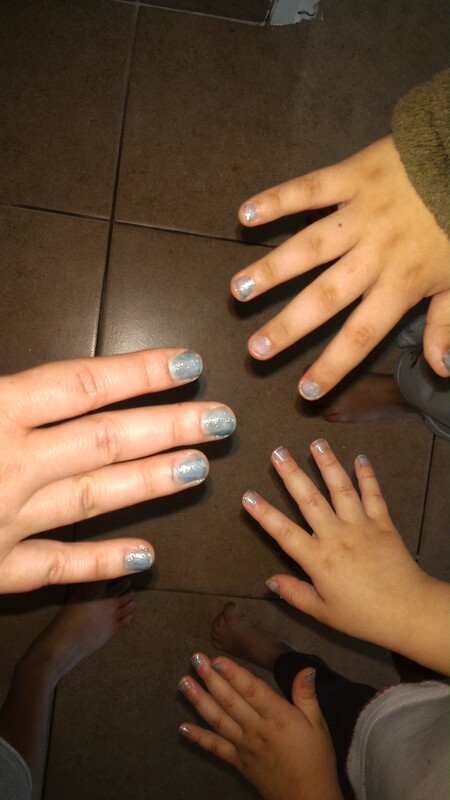 But when my 7-y-o son asked for sparkling nail polish, I did hesitate. Is he gay? Will other kids laugh at him? In the end my husband and I decided that it doesn’t matter. If we tell our daughter she can do anything but pee standing up, and my sons that they can do anything except give birth, shouldn’t we put our money where our mouth is? My son loves sparkling things – he’s at an age where he considers gold and silver color the height of good taste – and why should I deny him something that doesn’t hurt anyone? We did warn him that maybe some kids will laugh at him, he said he didn’t care. We’re the sparkling blue family! 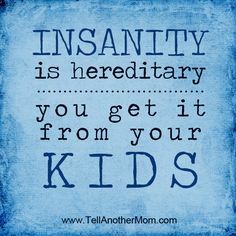 (Except my husband and eldest son, who didn’t show any interest whatsoever 🙂 ) And he went to synagogue and played with his friends and no one seemed to care. * Checkout my sparkling blue background! I’ve just discovered pixabay for great public domain images (even though it’s been around for ages). Thank you! About two years ago, a friend of a friend offered to make us a craft kit for my then two-year-old for a low sum, including stickers, glue and things to glue, crayons, markers, paints, and dough. We tried it out and found what our son liked and what we liked: We didn’t like paints at home, our toddler loved glueing things and loved dough. 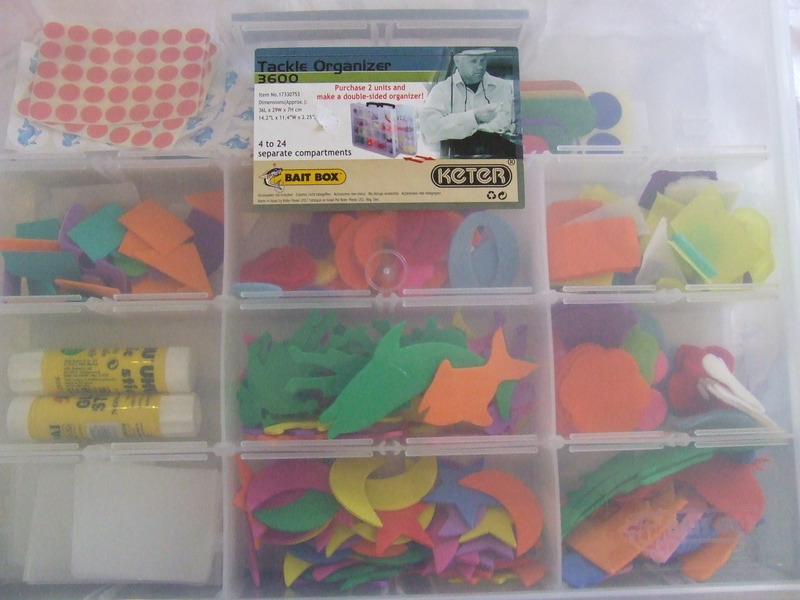 It was very convenient to have everything on hand, and we bought the specific items as they ran out – mostly more stickers, glue, and glue-ables (shapes of felt or paper, etc.). Our only complaint about it was the boxes used – the main box was cardboard and easily got bent; the inner boxes were flimsy plastic that were difficult to open and close and keep opened and closed; most things didn’t have a box at all. The dough soon became a separate entity and was accorded its own box. The markers and crayons also moved to a separate box, especially when my youngest became old enough to use them – he loves drawing. But for a long time we stayed with the original flimsy boxes. A week ago we visited the shop of Keter plasticware. I looked for a box we might use, an I found something for fishing – a tackle box. It is pre-partitioned into 4 compartments and you can add more. Perfect. 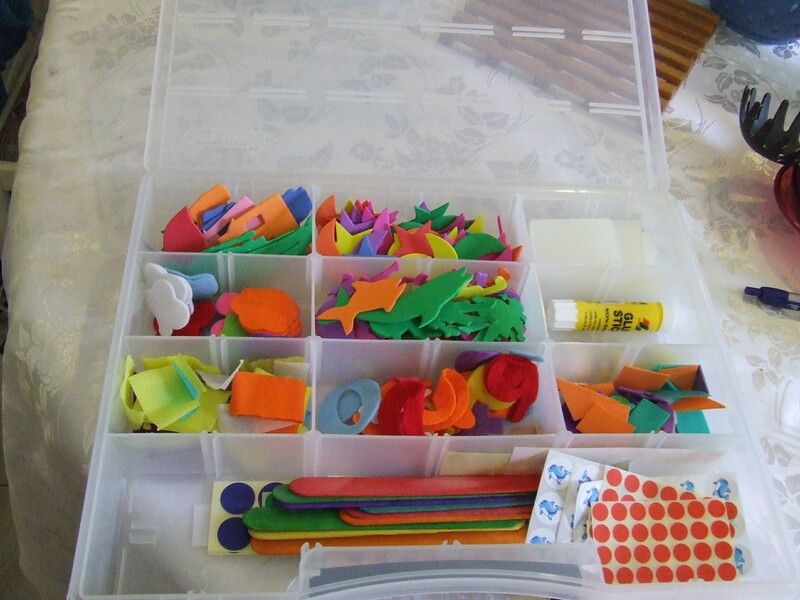 At home, I filled it and arranged and voila – a perfect gluing kit for my eldest (my youngest still doesn’t use glue). We bought a big box (up to 29 compartments) at 32 NIS because he likes having lots of different stuff, but there was also a smaller box with 15 compartments for 15 NIS. And it fits perfectly into our crafts closet, doesn’t spill, and is durable.